These raw edge crop jeans are not part of the current sale but I just wanted to quickly review them. I ordered 00 regular and they fit me perfectly. I’d say these run about one size larger than my usual Ann Taylor sizing for denim. The regular missy inseam (26″) is the perfect ankle length on petites. I thought the legs would be a skinny fit but these are actually straight leg jeans as you can see here. The rustic wash is nothing like the online stock image as you can in the above photo. I didn’t really care for this style and I also can’t wear these to work so I returned them. 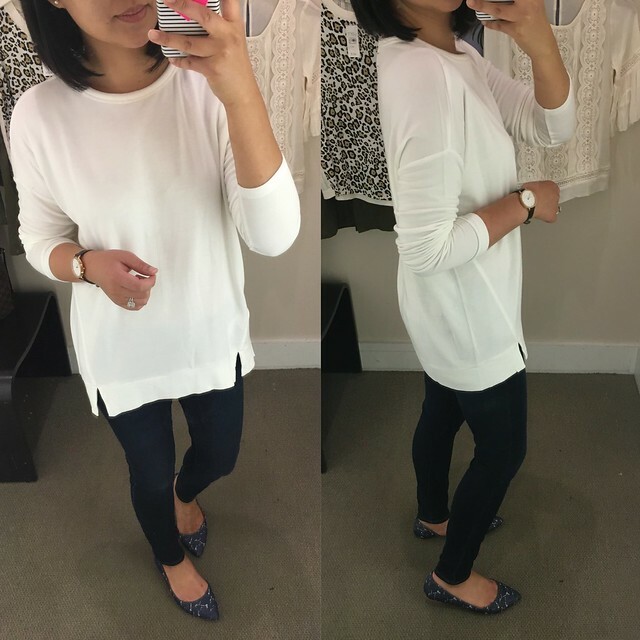 I tried on this tie-neck blouse in size XS petite and the fit is loose and slightly boxy but it still looks cute. The petite length isn’t too short which I like. I like the ribbon tied loosely at the v-neck. It’s currently on sale plus an extra 40% off so I got it for $38.99 which is still pricey for a sale item in my opinion. I love the fun dot print and it will be a perfect layer under my cardigans and jackets for the fall. 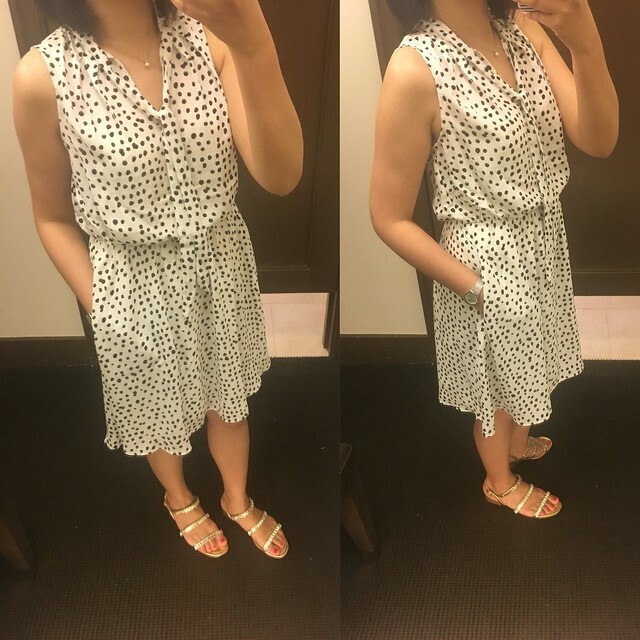 When I spotted the same adorable print in dress form I had to try it on for sizing. Unfortunately the dress runs big and the top portion is too billowy to look good on me. If you’re small chested the top of the dress will completely swallow you up. Refer to this clip I saved from my instagram story for a better look at the fit. 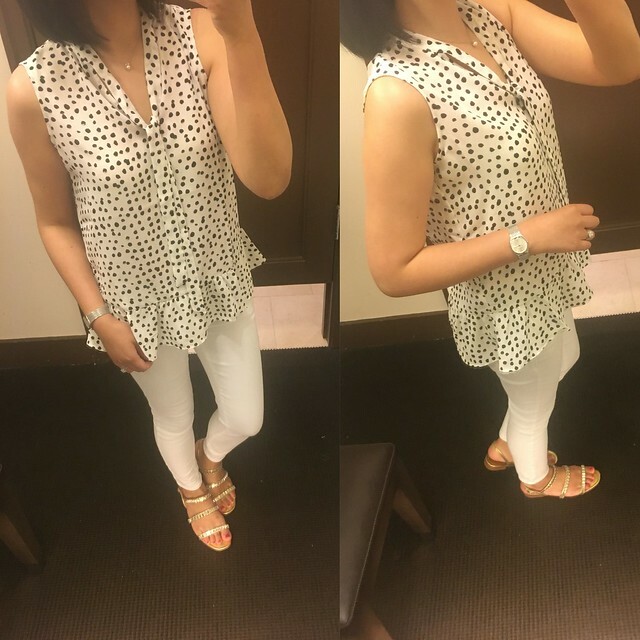 Lastly, I also tried on this Sloan-fit dot print ankle pant and size 0P fit me really well. Usually Banana Republic bottoms runs more true to size so I’d say these pants run about one size larger since my waist is closer to a true size 2 these days. I brought them home with me since they were 40% off ($58.80 after discounts). I can’t find the exact pair I purchased in store but the item number on the tag is 347833. 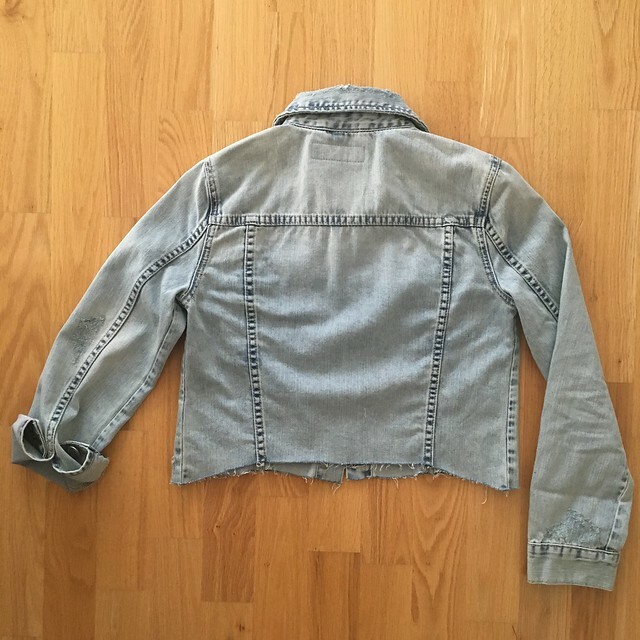 I am also eying the chambray pair and I wish I tried them on for sizing because they are made of a different material so they may not have the same stretch. 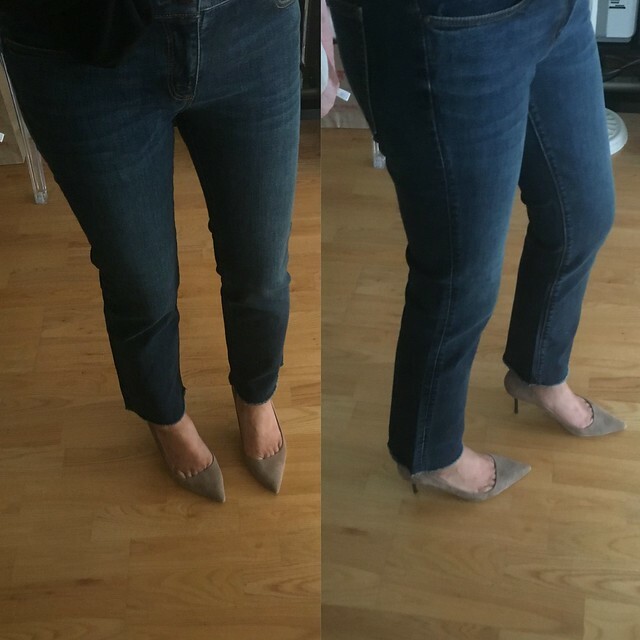 If anyone is looking for skinny jeans with a very narrow ankle opening and 26″ inseam then I would recommend trying these skinny ankle jeans. Size 0/25P was too tight on me so I believe I needed size 2/26P which was not available at my local store. This windowpane blazer is amazing and size 0P fit me well but I wasn’t sure how much I would wear it and to be honest it was over what I was willing to spend at $107.99 after discounts. J.Crew – Get 30% off your order of $200+ or 25% off your order of $125+. Use code SHOPMORE. Online only. Sale ends 9/5 at 11:59PM ET. Now is the perfect time to stock up on some Gemma flats. J.Crew Factory – Get 50% off everything in stores and online. Plus get an extra 50% off clearance using code WOOHOO. Prices as marked online. Sale ends 9/4 at 11:59PM ET. LOFT – Buy one style and get the next at 50% off. Select fall styles starting at $25. Plus get an extra 50% off sale styles. Since no code is needed you can use the stackable code INSIDER635 online for an additional $25 off qualifying full-price promotional purchases of $100+ (excludes Lou & Grey items). Please refer to my previous post for my sales picks. 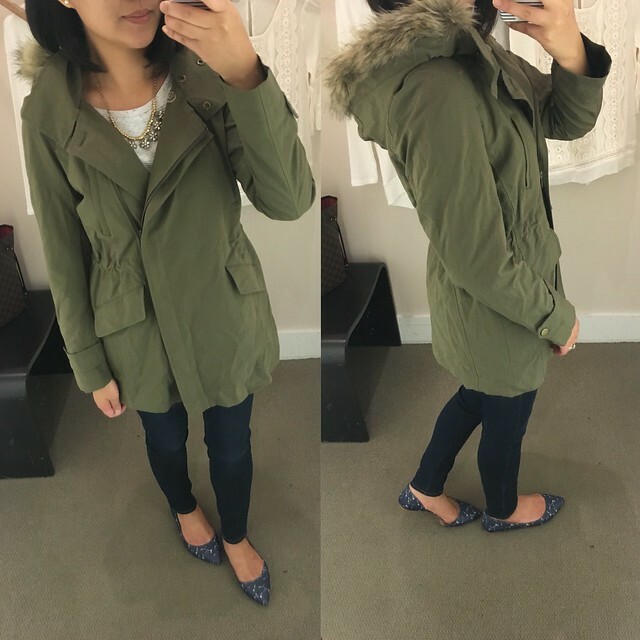 I tried on this faux fur trim parka on Friday and I am obsessed! I can’t wait until the next decent sale to pick this up. Size XSP fit me really well. 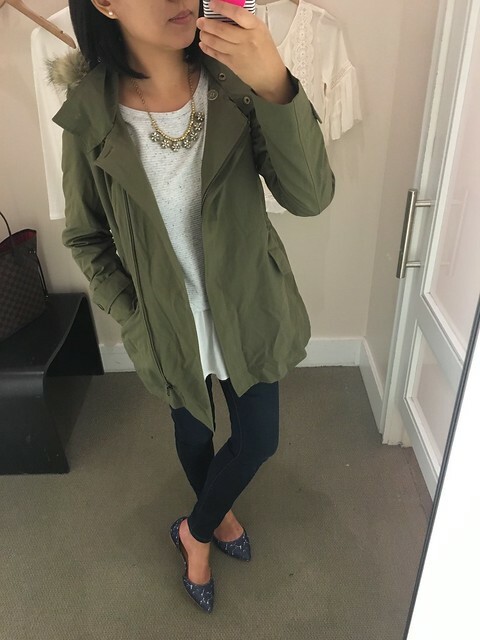 I’d say this jacket runs true to my usual size at LOFT. I love the cinching at the waist and the jacket is lined so it’s the perfect weight for the fall. I love this olive color but the stock images suggest it may be available in other color ways. The hood is removable but I love the little faux fur trim detail so I would just keep it on. 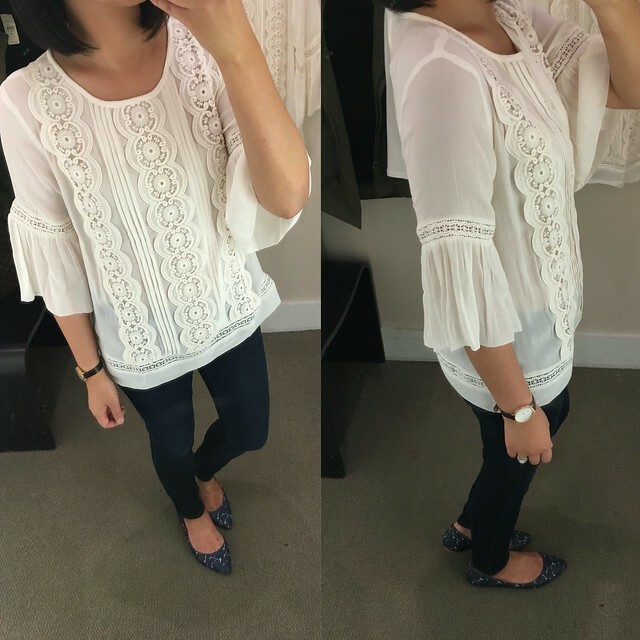 Next, I tried on this lacy bell sleeve top in a few different sizes. 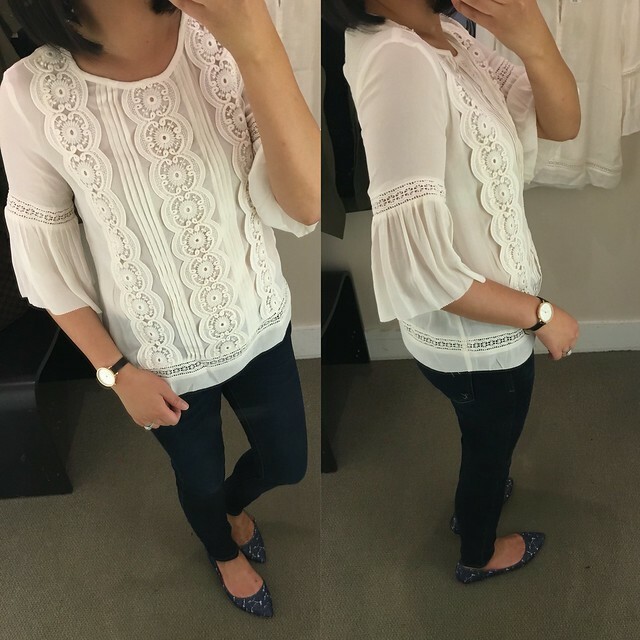 I specifically stopped by to try on this gorgeous top for sizing since I wasn’t sure if size XXS regular would fit me and it’s an online only size. Surprisingly, size XS regular fit me the best in the overall length. The sleeves for size XSP were too snug and short on me. Size SP fit similar to XS regular but it looked slightly boxy on me in the body due to the slightly shorter length. The embroidered detail at the sleeves sticks out a bit but after a good steaming the sleeves drape flush against my arm as you can see from my photo at the beginning of this post. Note that this top is sheer and will require a layering cami. The current LOFT sale is rather disappointing but I brought this top home with me since I’ll be going on vacation soon. 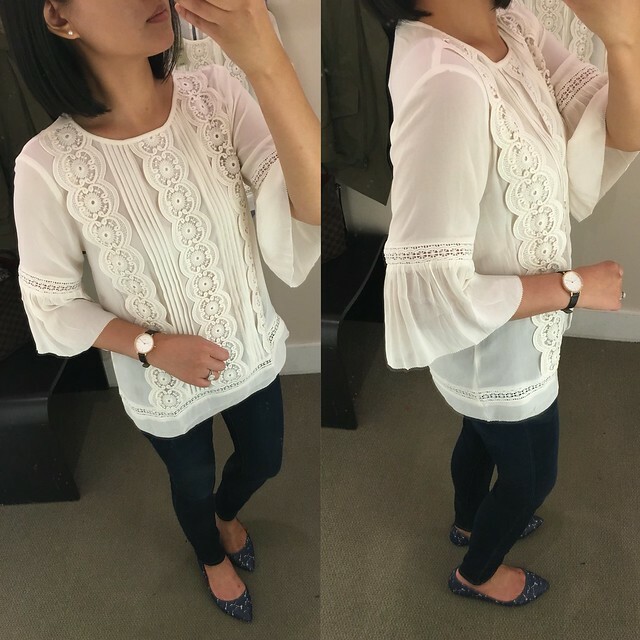 I loved this Lou & Grey relaxed signaturesoft top in white. Size XS regular fit me really well so I’d say this top runs true to size to a bit smaller than typical Lou & Grey sizing. The length and drape is very forgiving but the one I tried on in store had makeup on it around the collar. It’s currently 25% off plus free shipping if you want to purchase it through Lou & Grey’s site. 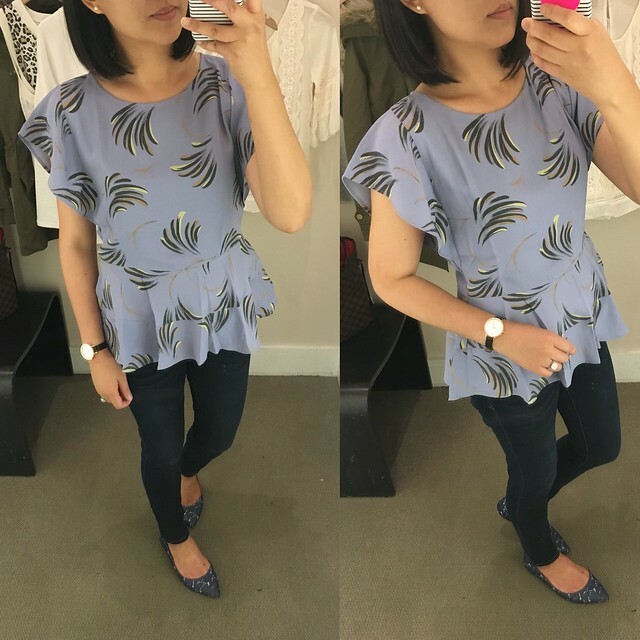 I loved the print and color of this willow peplum tee but the ruffle sleeves are a bit overwhelming on my frame. 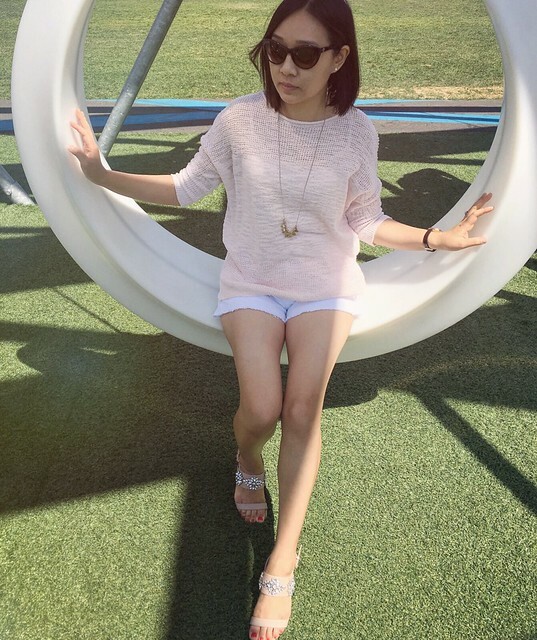 This top does have a cropped fit making it petite friendly. Size XS regular was a bit loose on me so I’d say this top fits true to size. 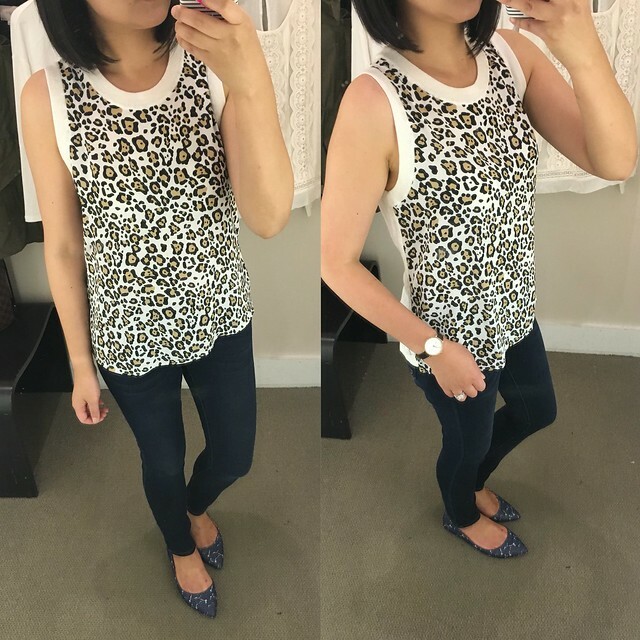 I tried on this spotted sweater tank in the sales racks since it looks so cute on Su. It fits the same as the tiger sweater tank I reviewed here. It fits true to size and it’s currently only $20 after discounts. Lou & Grey – Take 25% off everything plus free shipping. Use the code LONGWEEKEND. Valid in-stores and online through 9/5. 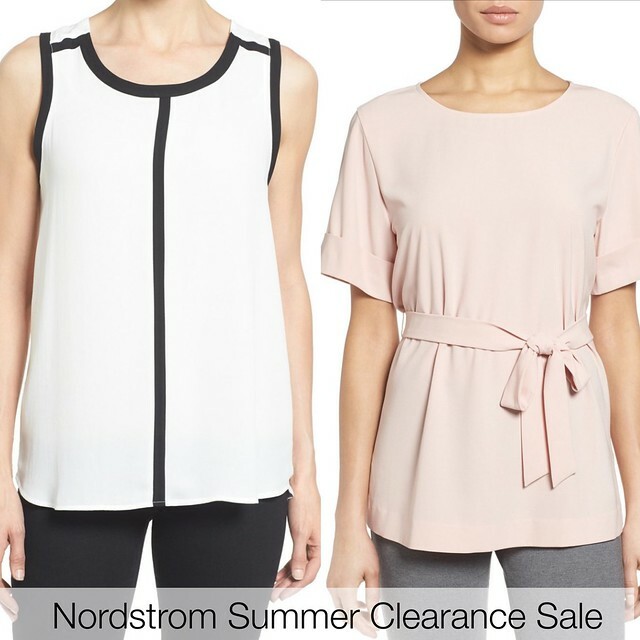 Nordstrom – Save up to 40% off during Nordstrom’s summer clearance sale. 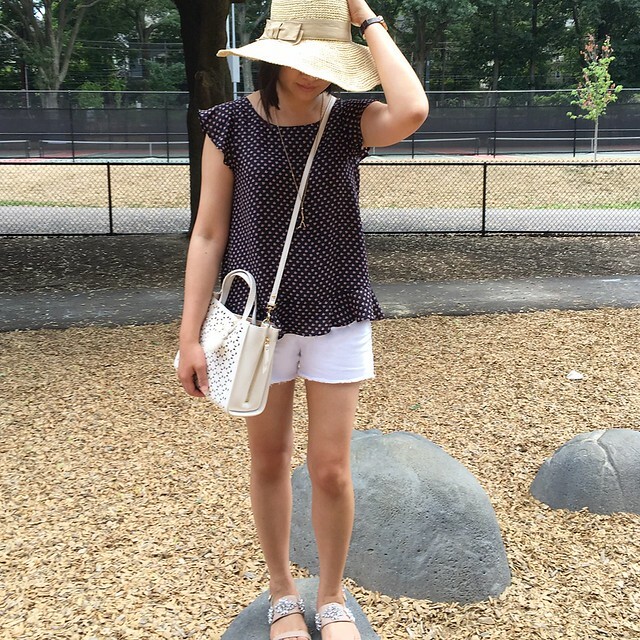 I ordered the two tops pictured below as well as this panama hat to try. I wanted the Halogen belted short sleeve top during the #NSale so I’m glad its available for me to try once again. Update 9/9: I received all three items but they did not work out for me. Size XS of the Pleione contrast trim blouse fits like size S and the arm holes are huge. The Halogen belted top also ran big since size XXS petite fit like a regular size small. It did not look good belted since there was a lot of excess material on the sides. 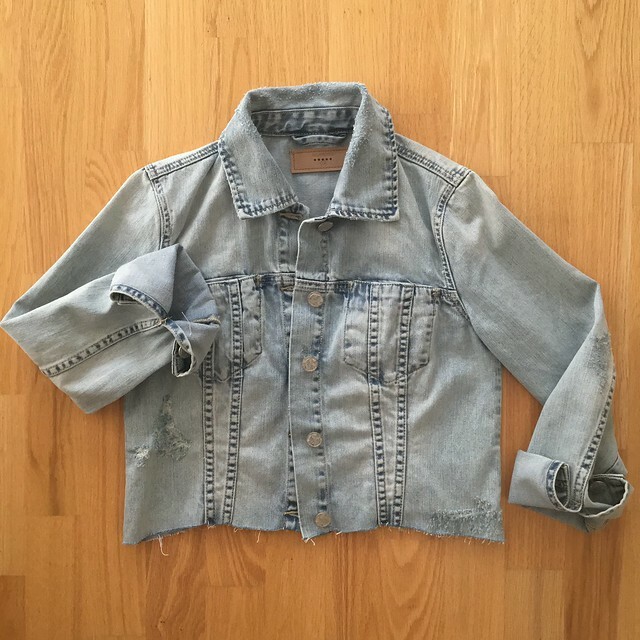 This BLANKNYC crop denim jacket is not part of the sale but it’s something I purchase recently when my size popped back in stock to try. Size XS regular fits like petite 0/XS. The light wash looks great with dark tops and dresses but I’m not sure how much use I’d get out of this jacket. I’m currently on the fence about keeping it since I’m such a jacket hoarder. Refer to this clip I saved from my snapchat (username: whatjesswore) here to see what it looks like on me. Update 8/4: Thanks to Su for mentioning in the comments below that the same jacket is available via ASOS for only $45.14! 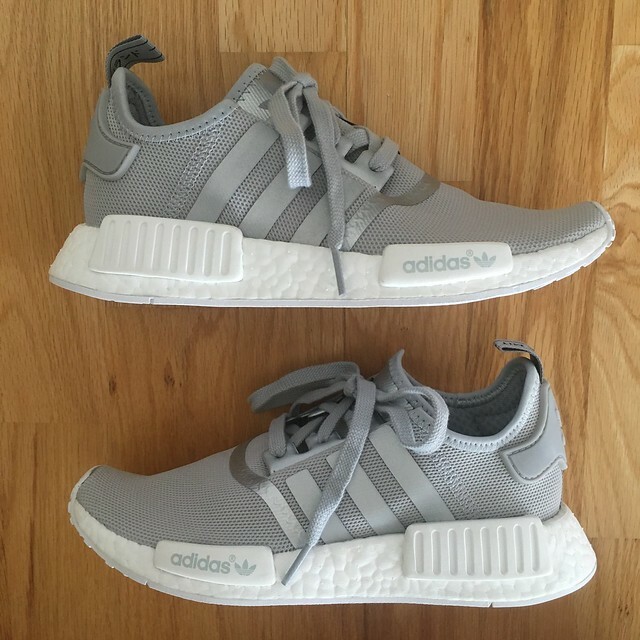 I also snagged these coveted Addidas NMD – R1 running shoes via Nordstrom right before they sold out. I took my usual size 7 despite the fit recommendation to size up. I can’t wait to try them out the next time I go on the treadmill. My husband loved these and wanted a pair too so that we could twin but I couldn’t find them in this color in the men’s version.